The Volcano Digit impresses with its robust and purely electromechanical design. High quality materials and craftsmanship guarantee a long working life – made in Germany by Storz & Bickel. Easy Valve Starter Set included at no additional cost. 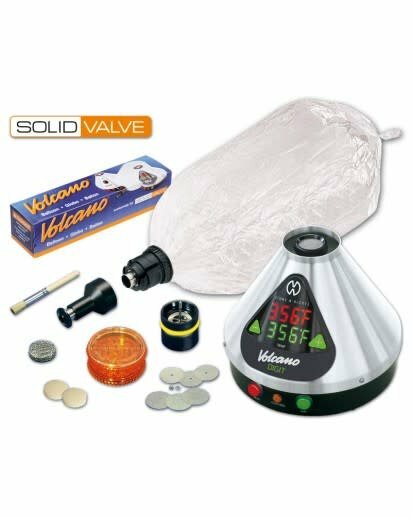 The VOLCANO Vaporizer is the ultimate system to release the flavor & aroma from smoking blends, spices, and essential oils. Every VOLCANO is crafted in Germany with food safe, flavorless, and heat resistant materials. Built to exceed the daily demands of professionals and connoisseurs, the precise VOLCANO heat controls gently heat and never burn. The Storz & Bickel 3 Year Warranty is standard with every purchase. 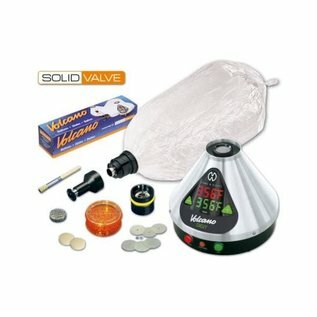 The VOLCANO is the only Vaporizer certified by ISO quality manufacturing standards and meets NRTL and UL requirements. This is where the only real difference between the Volcano Classic and the Volcano Digit arise. Employing an analog design, the Volcano Classic features simple yet precise temperature control with a range of 266° F - 446° F. The Volcano Classic delivers some of the most accurate temperatures to your smoking blends with an accuracy of ± 5° C / 9° F. The Classic does not display the temperature on its analog dial and instead displays numbers 1-9 and has a chart included in the box, which shows what temperatures the numbers correspond to. Outfitted with digital temperature control, the Volcano Digit brings the most precise temperature control and flexibility with a range of 104° F - 446° F. The Volcano Digit delivers slightly more accurate temperature to your smoking blends with an accuracy of ± 1.5° C / 2.7° F. The LED display will show you the current temperature as well as the set temperature.